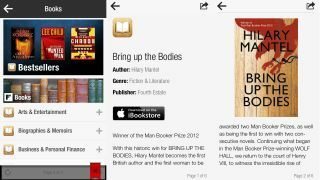 Apple has partnered with Flipboard to showcase its iBookstore books through a new section of the magazine-inspired app on iOS. iPad, iPhone and iPod touch Flipboard-users will be able to browse and buy books through the app, with Flipboard apparently taking 5 per cent of every sale. The new section is Apple's iBookstore, and the uncharacteristic partnership should solve the Cupertino crew's big problem of getting the right books in front of the right people – browsing the iBookstore is onerous at best. But Flipboard is geared towards finding new and interesting things, laid out in a deliciously eyecatching way. It's not quite the same as whiling hours away in a dusty old bookshop though - the new biblioboard section turns out to be little more than a glorified catalogue. Still, you'll be able leaf through the latest and most popular books in 25 various categories, from bestsellers to fiction and literature, children and teens, biographies and more. Once you've bought a book, you won't be reading it in the Flipboard app though; it only showcases the description, cover art and link to buy – everything else takes you out of Flipboard and into iBookstore and iBooks. The new book section is live now in the iOS Flipboard app in the US, UK, Australia, Canada, Brazil, France, Germany, the Netherlands, Italy and Spain.